Your mid-season finale is our proudest achievement. It’s Out With Dad as you’ve never seen it before. Rose may be down but Claire has a cure for that. 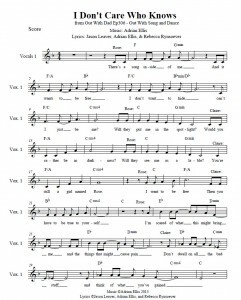 Download the sheet music here! Let it go!! Let it go!!!! Thank you! It’s our proudest accomplishment! I had to watch this lightheartedness after forcing myself to watch episode 3.14, I smile every time I watch it. I marvel at Caitlynne’s singing talents and Lindsay isn’t too bad either, so they’re both a pleasure. The ending part though….fills with dread and foreboding, even though we know what happens. Again, good job Jason and gang! Why can’t Claire be a real person (not just a character) so I can date her!? Quand pourra t-on voir l’épisode 7 saison 3 en France? Sur quel site? last night i wanted to watch the new episodes so my ma said she wanted to watch them too. i tell her she had to watch this one first. as the episode went on she kept saying she is cute (clare) then she said a girlfriend like that. I just watched three seasons in two days. Moved to tears, worried for Vanessa. The cast, writing and entire show are phenomenal! So powerful. Simple scenes are riveting. Loved this ep. Such a feel good song for Rose. So sad for Vanessa though. Can’t wait for the new eps. it says on the page when is the next episode its on march, but is it early march or mid march? We’re not 100% sure. But when we are sure, we’ll post it on our /whenisthenextepisode page. My story is really close to Vanessa’s story. Thank you for making this web series and it really brightens my day to know that I am never ever fully alone in my own rainbow story of my own. I’ve always thought this when people say it’s only one part of you “it’s just one color in your rainbow”. Yes it is just one part however it’s like a painted rainbow. Roll with me here, that one color effects so many other colors. Like you can take yellow a primary color, and when mixed with blue it’s green. You can also make different tints of green depending on the amount of yellow used. I just wanted the share my thought on that thanks for reading. I just loved it!!!!! The musical was amazing, and the way Vanessa’s history is mixed in the episode just speechless. Can’t wait to see the new episodes!!! Excellent job you’re making. Lots of love from México, happy hollidays to every one in the staff. God bless you all! Can I just ask why we have to wait untill next year to watch the next episode, since they’re ready now? When are the next episodes coming? In Early January, Middle January, or Late January? Hey listen to the instrumental music at the beginning of season 3 episode 1. It is the instrumental to this song. Where did you hear it. I was just rewaching season 3. I said it on youtube, and I’ll say it again here: I absolutely LOVED this episode. It was unexpected and obviously not the usual drama, but you pulled it off in such a heartwarming and adorable way, I can’t even get over that. Hmm…not sure if you guys pulled this off. es increible como se han superado a uds. mismos… cada detalle, cada minisodio…. Vanessa’s situation is seriously breaking my heart. A bit confusing, but cool song. Was it the actors voices or a voice over? Felt very Disney even tough Disney is not very known for gay songs. Love it… but poor Vanessa. I’m bisexual, too. And sometimes I was quite confused. Ooooh DRAMA!!!! Vanessa leaving her family, Rose and Claire being outed and Rose not knowing about Nathan and Angela. I hope we will get to see more of Kenny and Alicia’s relationship and I hope that there will be more LGBT characters and I hope that we will see more of Vanessa. I really hope that they take the time to explore the issues that Bi-sexual people have with coming out as part of the Vanessa story. I think it will be a good way to bring more legitimacy to a real identity that many people brush off. I also just want to see Lindsey act more because she and the whole cast are phenomenal and what you guys are doing with this show is amazing! Here we go; this will be stuck in my head for at least the next three weeks… To quote Rose: FULL BLAST ^___^ Let’s put it this way: I got this thing for a webshow named OutWithDad and I seriously enjoyed every bit of that new episode! A little feel-good-musical episode was just what I needed now 😀 Thank you so much, I can’t wait for more! Wonderfull episode!!! It’s just amazing!! Congrats!! thank you very much!! WOW! That might be my favorite episode of anything!! Wow just wow i didnt see this coming… Musicals are the best… Such happiness for Rose and Claire. That vanessa drama is gonna be good. Cant wait till the second half.. Keep it up guys thank you for this show. That was a really sweet song! Is this the last episode of OWD?? Just a break till end of january. Oh, what a relief!! haha can’t wait for the next! This is the best thing I’ve ever seen in my life. At first i was all, oh fun breather episode after y’all ripped my heart to bits yesterday… Then the last scene… If i didn’t love you all for this great show, I would eeerrrrrr!